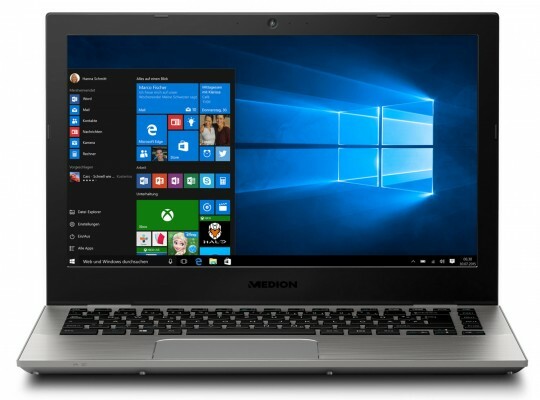 Being only 17 millimeters high and weighing only 1.3 Kilograms, the MEDIONÂ® AKOYAÂ® S3409 presents itself as an ultra-thin and surprisingly lightweight notebook. The stylish notebook with aluminum housing also features a backlit keyboard making work or play easy in low light situations. The laptop comes pre=loaded with Windows 10, a powerful processor (Up to IntelÂ® i7 processor 7th generation) and an integrated graphics unit for top performance while working, playing or relaxing. Another highlight is the optional 13.3" QHD+ display featuring 3,200 x 1,800 pixels and IPS technology. The Laptop can house up to a 512 GB SSD drive.